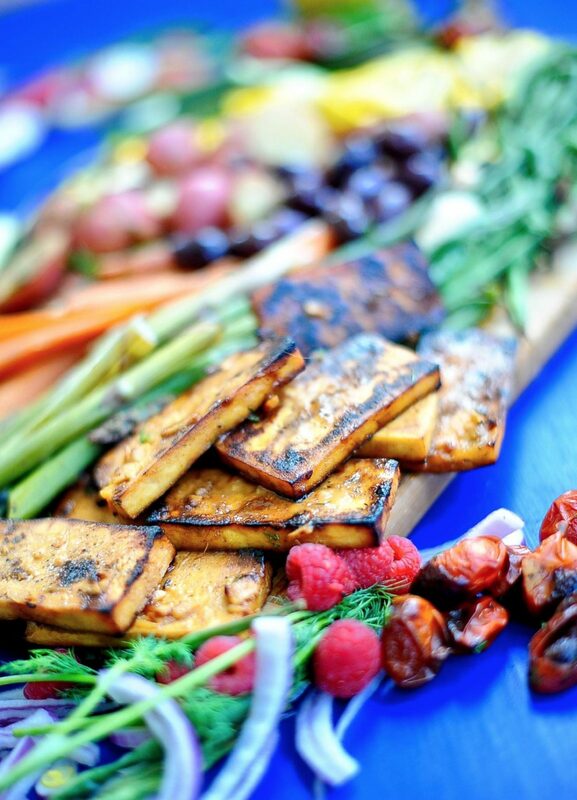 Linger over a platter of roasted veggies, brine cured olives and sticky orange tofu. Who need plates? Share it between you. A nibble of green bean here, a tidbit of gossip there, a spear of asparagus, a good laugh, the crunch of pickle, silence, the pop of roasted potato skin, laughter. The sun will set, the moon will rise, and still you will linger over this tray simple ingredients. As someone so sweetly pointed out to me this is a Niçoise Réinventée, a reimagined Niçoise. I imagine myself a peasant heading to the vegetable patch and pulling from the ground what was most succulent. Entering the pantry and doing the same. Here in America there is an obsession with drinks colder than a glacier and soup hotter than Hades. In the Mediterranean room temperature food is where it’s at. This dish can be as simple or as ornate as you wish. 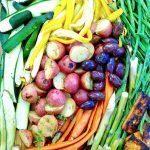 Raid your fridge and roast what ever veggies you have in there. Pull out some pickles, olives or capers. You can see from the photos that I chose Kim Chi. Vegetables taste best room temperature. There are those high-school friends that come up with band names. Those are the cool kids. There are others like my life-long friend Leigh and I that come up come up with restaurant themes. I had to go to Greek school, where I learned valuable lessons such as, “If Nick has one goat and Maria has nine, how soon will they marry. Here is the scenario, there is a knock at the door. We open it. In comes a costumer. We rummage in the fridge and hand them a container of cold spaghetti and a fork. Customer: Umm excuse me can I have a plate? Us: What are you crazy, it’s leftovers. Is tupperware not good enough for you princess? Customer: Umm, it’s cold. Could you heat it up? Us: Heat it up? Who does that? It’s leftovers. Us: It’s leftovers, go eat over the sink and wash a few dishes while you’re there. Sure that no one else in first grade would have a coat as ugly as mine I grabbed hers by mistake. Hijinks ensued and she showed up on my doorstep that afternoon while I was stuffing my face with Ritz crackers smeared with Peanut-butter. With my coke bottle glasses, wild brown hair and sweater liberally sprinkled with cracker crumbs it is a wonder that she stood her ground. She passed the first test being my friend. Sat on their park bench like book ends. A perfect summer dinner. 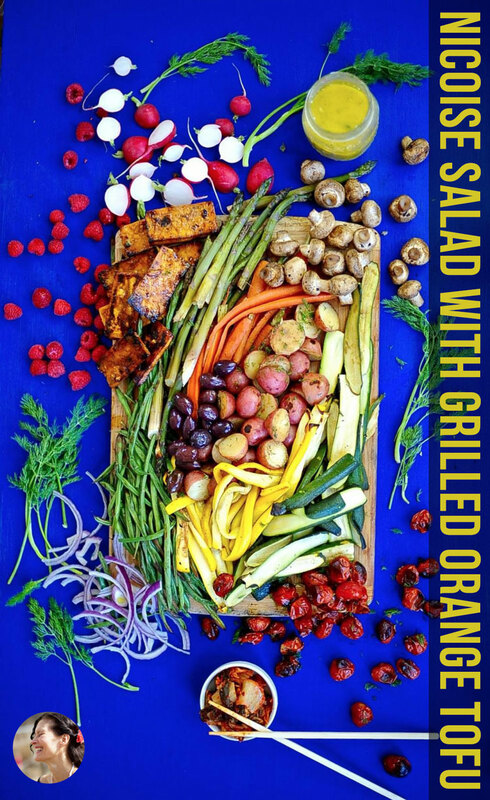 Avoid heating up the oven and throw everything on the grill for a quick char or make a summer feast in your oven. Guests coming tomorrow and no time to cook? This salad tastes even better the next day. I always make enough to pick off of for a few days. Don't feel bound to use the veggies I used. 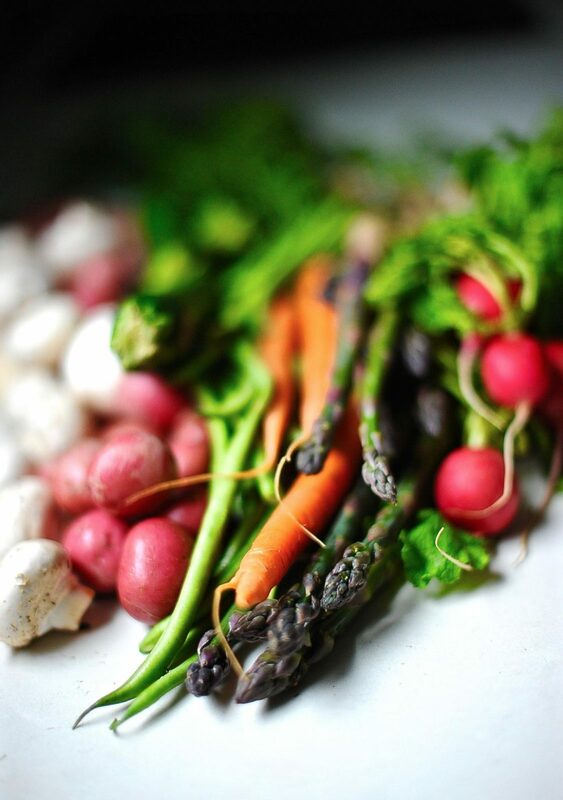 Choose what ever looks best at the farmer's market and mix and match your favorite veggies. 1/2 pound thin spring carrots sliced lengthwise. 1/2 pound zucchini and/or summer squash. sliced lengthwise. Fire up the grill or heat up your oven to 450 degrees Fahrenheit. Slice your tofu into 1/4 inch strips and place each on a clean a clean kitchen towel. Once all your strips are laid out on the towel. Cover the tofu with another clean towel and place a cutting board on top to press any extra liquid out of the tofu and allow it to soak up more marinade. While your tofu is pressing place the orange juice, soy sauce, garlic, lemon juice, apricot jam, Sriracha and fresh ginger in a sauce pan. Place over medium heat and allow to simmer and for 10 minutes. Dip the tofu strips in the orange marinade coating both sides and place on a lightly oiled sheet pan. Place your sheet pan in the oven on the highest shelf and roast 10 minutes. Pull from the oven, flip the tofu and roast 5 more minutes. Remove from the oven. If you are grilling then grill the tofu for 4-5 minute on each side. Remove form the grill or oven and brush with more marinade. I don't use oil when I am roasting veggies but feel free to toss them in some if that is how you like them. I like to use 2 large sheet pans for roasting my veggies. Prepare the veggies while the tofu is cooking. Boil your halved potatoes for about 10 minutes until barely fork tender. 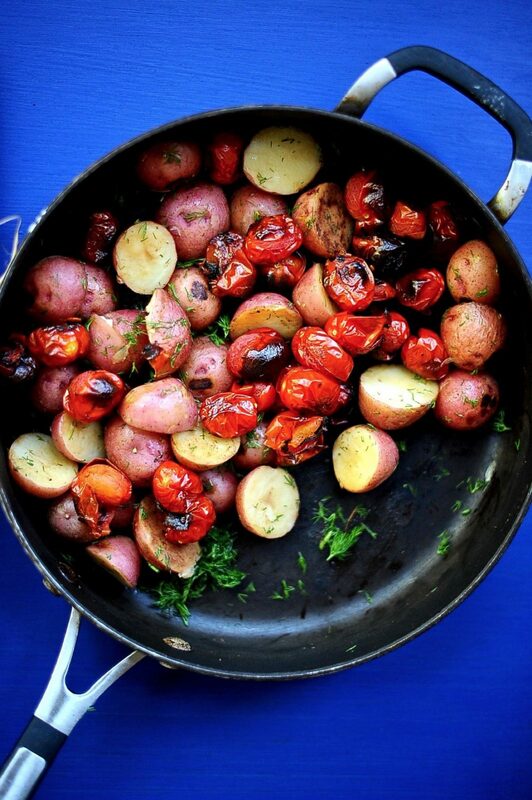 Drain and place your potatoes into a sheet pan with the carrots, summer squash and asparagus. Into the other sheet pan place your tomatoes, mushrooms and green beans. Spread them out so they are in a thin layer. Roast your veggies until just tender. Test every 6-7 minutes and remove once tender. Usually my green beans come out first, followed by zucchini and summer squash. I like a bit of char on my tomatoes and mushrooms and so leave them in a little longer. Last to come out are potatoes and carrots. Tongs are a wonderful tool for removing the veggies as you go. Place all the dressing ingredients in a glass jar, cap firmly and shake untill emulsified. Or place all the ingredients in a bowl and whisk until thick and creamy. Now comes the fun part. Throwing it all together. Or rather artfully arranging it on a platter for you and your dining companions. I think that your photos can’t get any more beautiful and sumptuous and … guess what … they do. These are beauties. Thanks Alison, I spent a few days painting backdrops this week and I am having a ball with them. ayyyy, you got any left-ova Leftovers? Com’on Jo, i’ll do your dishes, you know I’m good for it, after all these years…..
I’m not sure if this joke (which plays on certain local stereotypes) will raise a smile on your side of the pond, but I submit it for your consideration. I think Big Helle and Torben — who developed the art of re-heating horrible coffee to a supreme level – would have loved it. Oh god that movie is so funny. I love that joke! BH and Torben the cat piss coffee drinkers would have appreciated it. It is very much Borsht Belt humor. 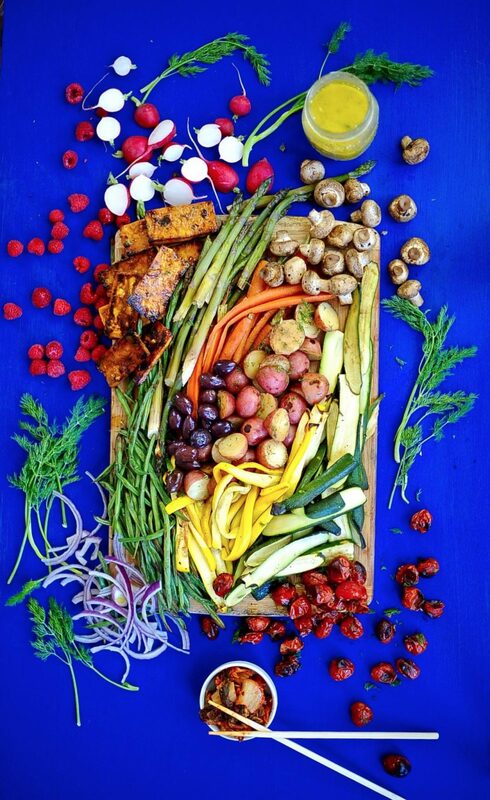 I can imagine sitting in the garden with you and a big platter like this nibbling until the mosquitos drive us in. A new app I just heard about offers a way to get/share left-overs and surplus food. The best kind of salad is a salad with choices. Where you can have a different bite for every bite. This is a perfect example of the best kind of salad. You are so talented.